Learners today depend on the latest technology—like smartphones and tablets—to help them fit online training into their busy lives. Statistics show that we check our smartphones an average of 150 times per day; it makes sense that we would want to have access to e-Learning content on our phones. The BYOD trend has been getting a lot of attention lately. More and more companies are allowing—or even requiring—their employees to use personal devices for job duties, instead of company-issued devices. When Cisco surveyed office workers internationally, 66% reported that they expect IT to allow them to use any device to access corporate networks, applications and information. To learn more, check out The Benefits of BYOD for m-Learning. A growing portion of Internet traffic is coming from mobile. More and more frequently, learners are turning first to their tablets or smartphones when they have a question or need to look up something. Designers and instructors are recognizing this and putting mobile first in e-Learning development and planning. This coincides with the growth of responsive web design. Responsive web design is the concept that e-Learning content should respond to a learner’s behavior and environment based on screen size, platform and orientation of their mobile device. In other words, your online training should automatically respond and adjust to your learner’s specific device. If you’re designing courses for mobile, look for an authoring tool that publishes to HTML5, like Lectora e-Learning software, and check out 5 Factors to Consider When Designing Mobile Courses or this iPad Designers Guide for helpful tips on designing your courses for mobile devices. Everyone is moving data to the cloud. Big companies like Apple, Google and Microsoft are all pushing cloud computing, and users are embracing it—with good reason. Cloud computing is inexpensive, simple to use and mobile-friendly. Information in the cloud, from learning tools to team project plans, can be accessed from anywhere, anytime and on any mobile device. Online collaboration software, including ReviewLink online course review tool, also makes use of the cloud, allowing you to share and review e-learning courses with your team no matter where you are, from your phone, tablet or computer. Looking to develop in the cloud? Lectora Online offers web-based, collaborative e-Learning authoring. It’s the easiest way to develop e-Learning in the cloud. Technology now allows for seamless integration with many different location-based services. For example, The American Museum of Natural History, in New York, has an iPhone app that offers you a customized tour of the museum and provides turn-by-turn directions to specific points of interest and to restrooms. For visitors who don’t have iPhones, the museum lends them for free. Some colleges and universities are taking advantage of smartphone GPS technologies to offer high-tech, self-guided campus tours. Businesses and organizations have a lot of opportunities to use location-based technology to greatly enrich the patron experience or even the corporate training experience. Learners are accustomed to the flexibility a smartphone brings. They’re connected no matter where they are, so why shouldn’t they be able to learn the same way? As described in The 2011 New Horizon Report, “People expect to be able to work, learn, and study whenever and wherever they want.” In Cisco’s study, 66% of workers said they would take a job with less pay and more flexibility in device usage, access to social media and mobility than a higher paying job without such flexibility. Mobile learning is great for performance support. Employees can access information immediately if they encounter a situation with which they aren’t familiar, or if they need to review a technique or process before performing a duty. This type of performance support reinforces annual training and results in a stronger, more confident workforce. It’s pretty clear that mobile learning is here to stay, and has a lot of benefits. 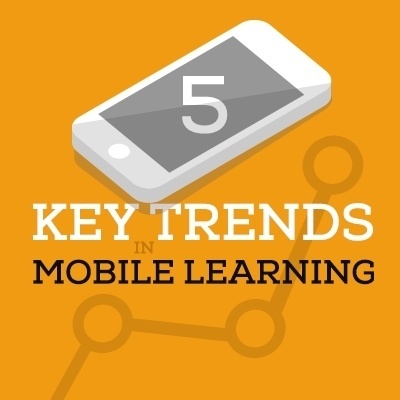 For current, cutting-edge content, keep these trends in mind the next time you’re developing a mobile learning course. The sky’s the limit, and it will only get more exciting as technology keeps improving!